Contact Anthony through email at author@wechoselife.com. 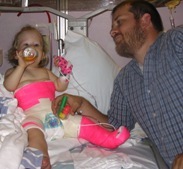 Anthony Horvath and his wife were given the option to ‘terminate’ their daughter after learning that she had spina bifida. They rejected this ‘choice’ emphatically. Their beautiful daughter proves every day that joy transcends circumstances. Though as a Christian apologist and author Anthony has always been pro-life, the situation has added new fire to his position and credibility to his arguments. Elected in July of 2010 to be the Vice President of Wisconsin Lutherans for Life, Anthony is actively living out his principles and passions. Customize… see below for other websites Anthony is associated with for ideas. Anthony is a member of the national speaker’s bureau for Lutherans for Life. He spoke at the national Lutherans for Life convention in the summer of 2010. At the same event he was elected to be the vice president of Wisconsin Lutherans for Life. He has spoken at numerous high schools, colleges, and churches, having presented on one topic or another over fifty times. He is a former junior and senior high school religion teacher and taught at a small Bible college while in Rockford, Illinois. He was a Director for Parish Ministries at a Lutheran church in Wisconsin for about three years. His current activities, besides his pro-life speaking and discussing his We Chose Life book, are related to his apologetics ministry. His columns have been published at Worldnetdaily.com and he has been interviewed on close to 30 Christian radio programs and heard by millions of people. He is a blogger for the ChristianPost.com and a columnist for TheCypressTimes. This page has links to his articles, columns, and some radio interviews. Browse various sized images of Anthony for use in web content and articles. (Smaller, web ready images here. Portrait Images, here).